Vegan honey… is that even possible? Yes it is! Today I show you how two simple ingredients can combine into a sweet and gooey thick syrup that will fill any honey void you may have as a vegan. 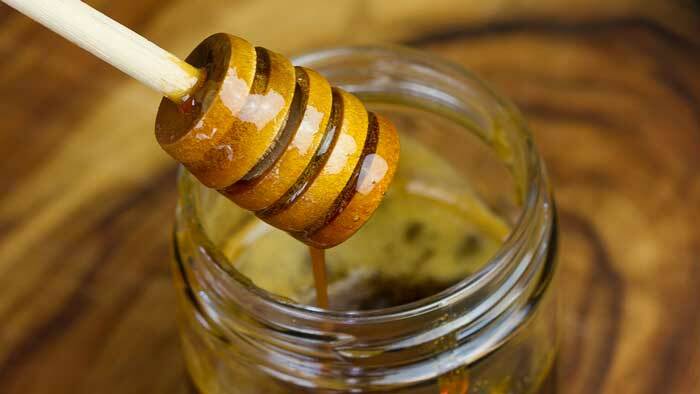 This is a tasty vegan honey alternative that kids and adults all love. Prepare a pan and stirring spoon. I like to use a non-stick pan so it makes clean up easier. Pour pineapple juice and sugar into pan. Turn heat to medium high and bring mixture to a light boil. Turn down the heat and keep the mixture at a steady simmer. Continue to stir the mixture to keep it smooth and to stop it from burning. After about 15 minutes you will notice that the mixtures become thick and gooey. Once it reaches the consistency you are happy with, remove the pan from the heat and let it sit for a few minutes. Pour into a glass jar... YUM!!! This looks great! Do you know about his long it keeps and should it be refrigerated? It should keep for weeks because the sugar acts as a preservative. I keep mine in the cupboard but you could keep it in the fridge if you prefer. I tried this from another site and it did not come out tasting good. I think maybe the coconut sugar may make the difference. Thank you. i have seen the same recipe with apple juice. What brand of coconut sugar do you use. I have never used it before. My husband and I are both plant based for health issues and your recipes look wonderful. I don’t use a specific brand… just whatever I find on the day I shop. I usually eat mine within 1 week. Fabulous 🙂 Thanks for the feedback!